Our Extension program launched this fall to train future teachers and child-care workers who can earn college credit while they learn their careers. UC Merced’s fourth school, with its interdisciplinary expertise and focus on management and complex systems, will train tomorrow’s leaders and innovators. Technological advancements are transforming the fields of anthropology and heritage studies, with UC Merced faculty leading the way. Using robotics and artificial intelligence, UC Merced researchers are helping farmers conserve water and optimize their crops. In just its 14th academic year, UC Merced made a giant leap in the U.S. News & World Report rankings, rising to No. 67 among national public universities. U.S. News & World Report ranked UC Merced No. 1 among public university for financial aid given to first-year students. The four-year Merced 2020 Project will add approximately 1.2 million gross square feet of teaching, research, residential and student-support facilities to the existing campus by 2020. UC Merced leads the UC system in the percentage of students from underrepresented ethnic groups, low-income families and students whose parents did not attend college. 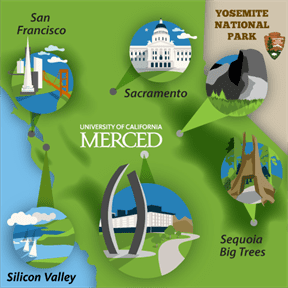 Nearly 40 percent of UC Merced’s undergraduates are from Southern California, 31 percent from the Central Valley, and 28 percent from Northern California. UC Merced is an extremely green campus, dramatically cutting energy and gas usage per student every year, showing water savings well ahead of goals set by the UC president and having every one of its building projects LEED certified.